Hand carved and hand painted leather & hand forged brass. 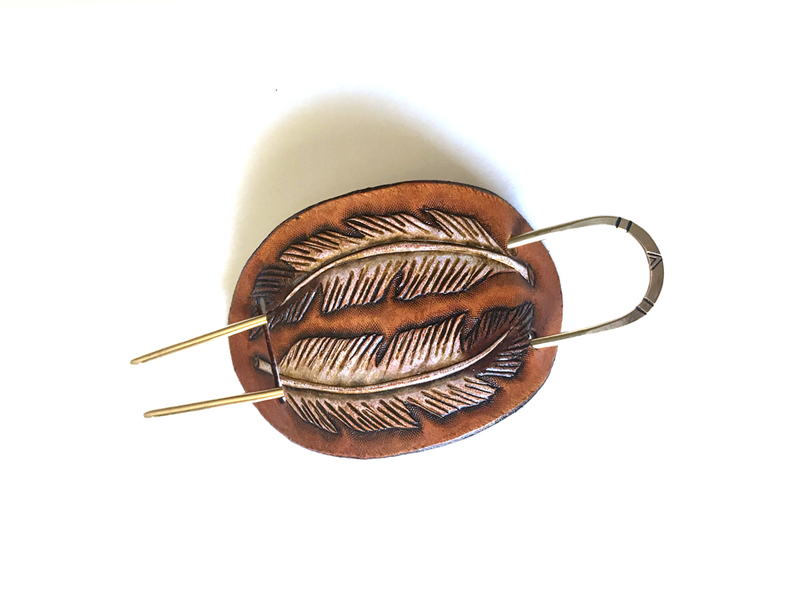 Hand carved and hand painted feather design on leather paired with a hand hammered brass hair pin with stamped accents. Use them together or use the hair pin alone for your favorite up-dos such as french twists, buns, messy buns, etc. Traditional metalsmithing and leather crafting hand skills are utilized in every individual piece. The leather goes through many steps from carving and stamping to the finishes to become what you see. Because they are made by hand one at a time (no machine stamping here!) and because of the variances in the leather, no two pieces are alike. They may vary slightly in design, painted colors and tone of the leather itself. The brass hair pins are also hand formed and hand hammered and stamped. A truly handcrafted piece of wearable art. Small: 3.25″ x 2″ Leather with 4″ Hair Pin | Best for short and/or thin hair. Medium: 3.75″ x 2.25″ Leather with 5″ Hair Pin | Best for medium length and/or thick hair. Large: 4″ x 2.5″ Leather with 5″ Hair Pin | Best for long and/or thick hair.